Will this Sandman bring you a dream like it did for me? The model is by Classic Carlectables and is based on the Holden VY Ute. 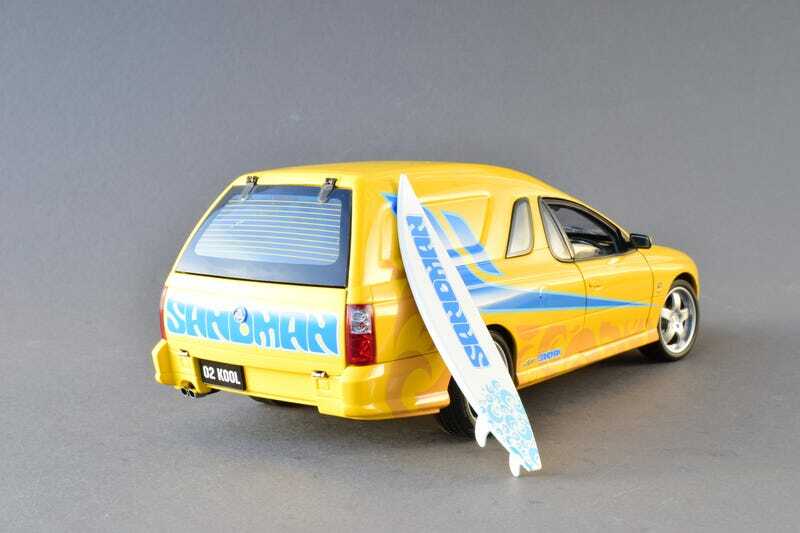 Since 2006 or so I wanted the “Ute with canopy” to go with my standard VX-based Ute. Unfortunately, the one North American source I had for my Aussie models closed shop in ‘07. Ebay, as always was a source, but shipping from Australia is RIDICULOUS. Eventually I was able to find this Sandman version cheap enough to offset the shipping cost. I don’t know much about the Sandman cars, but this one is a fantasy livery inspired by the Sandmans (Sandmen?) of the 70's and of the concept vehicle from 2000. If you’re not familiar with Classic Carlectables, their work is top notch. The paint quality and fit and finish are equal to Autoart, but they also usually throw in a working feature or two, and they don’t skimp on engine or suspension detail. The subject matter isn’t for everyone, if you get one, you won’t be disappointed. And now that I’ve inserted all these pictures I realize I didn’t take one of the interior or engine. Oops.